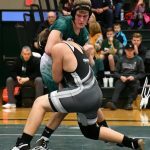 Central Montcalm Wrestling split their matches last night at home. The Hornets defeated Newaygo 54-12, and lost to Chippewa Hills 70-3. Bryant Knapper went undefeated last night. Wrestlers will be home for a dual against Reed City.